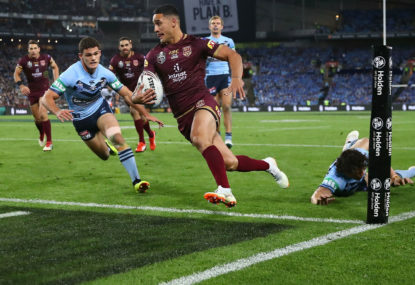 Queensland have opened the scoring in Origin 3, after a magnificent interception from Valentine Holmes saw him run the distance of the field and score a crowd-lifting try. The Maroons had the early ascendancy and looked to have got themselves on the board seven minutes earlier through a great aerial effort by Billy Slater – only for the bunker to rule the retiring fullback had knocked on in midair. New South Wales had struggled to get the ball out of their own back half, but a great run by James Maloney got them over halfway and in a strong position to score. Holmes was able to swoop on an errant pass close to his own try line, however, and easily evade the gallant chase by David Klemmer and Tyson Frizell to run over 90 metres and put the ball down just before the 12-minute mark.